The port of departure is the Ile aux Cygnes. Boarding starts 15 minutes prior to departure except on Saturdays when the 2 nd boarding starts at 09.30 p.m. 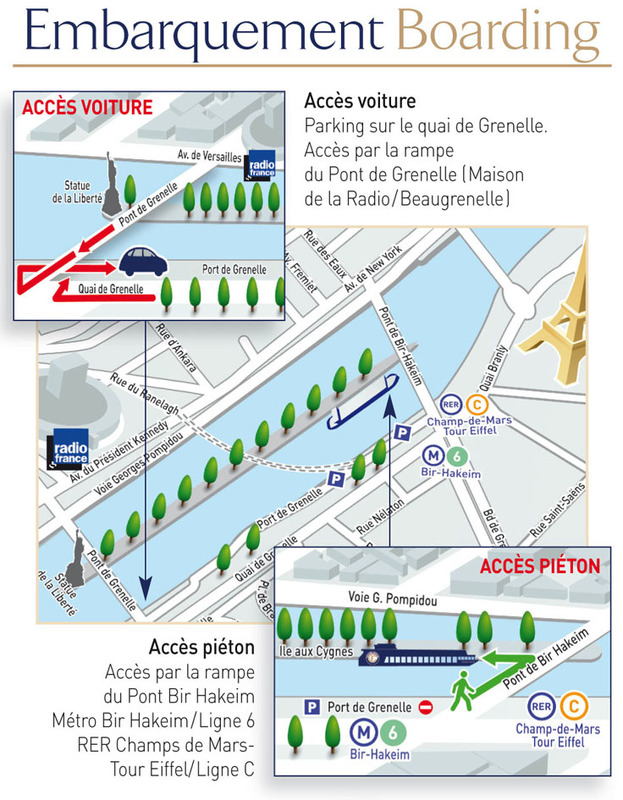 Proceed to Bir Hakeim Bridge (Paris 15e), head for the middle of the bridge, follow the flight of steps down at the centre of the bridge that lead to the Ile aux Cygnes… where the “Capitaine Fracasse” will be waiting for you. You have the possibility to drop passengers off in the middle of the bridge then park in the free private car park (200 spaces) and signposted “Capitaine Fracasse” and also called “Parking du Port Autonome” situated at the end of the bridge, 15e side (there is a slight downward slope at the end of the bridge to access the car park).